SUGAR HILL – Roger Aldrich is in France today, a country that is grateful he was there 60 years ago. If all went according to plan, he was on a special train at 5:30 this morning, full of fellow World War II veterans, bound for Normandy. Yesterday afternoon, head high and full of memories of comrades who never made it home after the war, he received a Knight of the Legion of Honor, the most prestigious award France can bestow upon a man. He is one of 100 American veterans selected by the French government to receive its finest honor. In his own quiet way, Aldrich is proud to have been chosen and proud to carry the memory of the thousands who never grew old and who never knew the gratitude of the country they were fighting to save. Aldrich, 81, grew up in Sugar Hill. After graduating from high school in Lisbon, he went to Northeastern University to study engineering, but a year later, with the war raging, he decided to enlist in the Army. He was 19. He became a mapmaker and belonged to the 62nd Engineer Company, whose duty it was to survey battlegrounds and map them out. In June of 1944, he was aboard a ship with 4,000 or 5,000 other men. He was an engineer replacement. Most of the engineers landed on D-Day. “We missed it by this much,” he said, holding up a thumb and forefinger. He recalled a delay in getting off the ship onto Normandy. “There was a big storm on the 19th – we sat off shore at anchor,” he said. Off all those on ship, it was this kid from Sugar Hill who wasn’t seasick. On the 23rd, they landed on Omaha Beach. Aldrich was in a survey platoon. The need for maps was still there and maps were drawn all the way to the Elbe River in Germany when the war ended, he said. Aldrich has been back to Normandy three times. After 40 years, it was a trip that helped him heal. Like many soldiers, Aldrich never talked much about what he saw, what he felt or the close calls he had. Ten years after that journey, he wrote Soldiering Yesterday, about his Army experiences – all the three years and 14 days he spent in the military. It was many years following his return home that he realized he had post traumatic stress syndrome. His last trip to Normandy was in April and he was accompanied by his wife, Nancy, their daughter, Kathie Cote and grandson, Christopher. Christopher, who is 13, wrote a journal about the trip, which touched Aldrich. In all his trips back to France, he has been treated with dignity and respect by the French people. Aldrich, whose family has been in town since 1790, returned to Sugar Hill and never left. 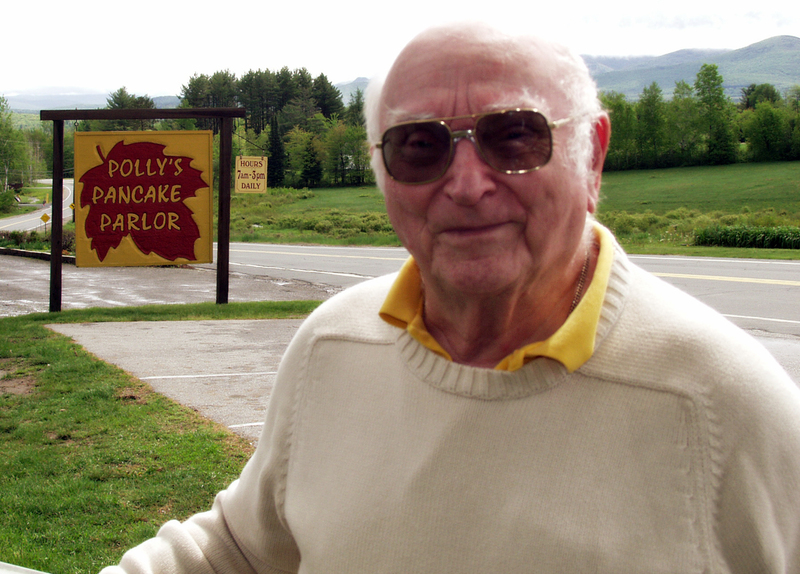 He married his wife, Nancy, in 1949 and worked for 20 years at a small print shop, before leaving to help his wife run the popular Polly’s Pancake Parlor, a landmark in the town. He also served as a selectman for 25 years, seeing the town through its separation from Lisbon in 1962. June 4, 2014 in North Country history, Sugar Hill. Roger, what a rich life you have personally had as you faced both the peaks and the valleys of your many experiences . In your travels and in serving your country it seems clear that you and your values were grounded in the very atmosphere emanating from New Hampshire’s land and its people. You have given your best and you have made a real difference – and you continue to do so, in person and on facebook. The spirit of Roger Aldrich day will last longer than 24hours.